Panel Discussion: February 11th, 6:30-8:30pm, The Third Wave of Feminism and Beyond. Organized and moderated by Liz Abzug, poetry reading by Anne Waldman, dance performance by Yukari Osaka of the Yaa Samar! Dance Theatre. Panel members: Anne Waldman, Lee Grant, Mia Herndon of the Third Wave Foundation and Jehmu Green, Director of the Women's Media Center and former advisor for the Hillary Clinton 2008 Presidential campaign. RSVP to: kirsten@stevenkasher.com. Steven Kasher Gallery is pleased to present a distinguished body of work by photographer Cynthia MacAdams. The exhibition will feature over 70 vintage black and white photographic prints of female artists, activists and intellectuals from the 1970’s, as well as everyday women and nudes. Images from MacAdams’ landmark photography book,Emergence, (Chelsea House, New York and London, 1979) will be exhibited along with photographs that have never before been published. In her Chelsea debut, MacAdams’ images of pioneering figures of the women’s movement such as Gloria Steinem, Kate Millett, Judy Chicago and Jane Fonda, remind us of the monumental steps taken forward during this pivotal historical era. In her introduction to Emergence, Kate Millett writes: They’re a new kind of woman. You haven’t seen them before. Neither have I. At least not in pictures. A new breed of us just coming into being, never recorded till now, never noticed, given a name…. Plenty of reasons why: the times changing, women rising, moving, shouting, demanding with determined eyes. How much more powerful then, the eyes they turn on each other and themselves. These women, these avatars. They do not conform…. Strong. Beautiful for themselves. Or even each other. The photographs include images of street people and noted actresses, writers, poets and playwrights, such as Laurie Anderson, Mary Ellen Mark, Patti Smith, Lily Tomlin and Meredith Monk. In this extraordinary collection of women’s portraits, MacAdams eschews the traditional relationship between the female model and the camera, and addresses her subjects like old friends in the middle of an extended conversation. The results are inspiring, thought-provoking and refreshingly forthright. MacAdams’ work has been shown in solo and group exhibitions throughout the United States since 1977. 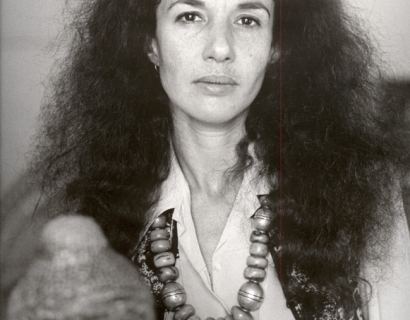 Four books have been dedicated to her photography, including Mayan Vision Quest, (Harper Collins, San Francisco, 1991), Rising Goddess, (Morgan and Morgan, New York, 1983), and Emergence, (Chelsea House, New York and London, 1979). Cynthia MacAdams: Feminist Portraits, 1974-1977 will be on view January 28 through February 27, 2010. Steven Kasher Gallery is located at 521 W. 23rd St., New York, NY 10011. Gallery hours are Tuesday through Saturday, 11 to 6 pm. For more information or press requests please contact Kirsten Bengtso at 212 966 3978 or kirsten@stevenkasher.com.